Once upon an album: Blog hop!! Hello and welcome to our very first challenge for 2015 at Lasting Memories! We're celebrating the new year and new Design Team with a blog hop. Super fun right?! If you're just starting the hop, be sure to start at Lasting Memories so you don't miss anyone - if you're last stop was Claire then you're on the right track! Our challenge theme this entire month is "Life's Moments" and our first challenge is "Life's Simple Pleasures" .. we want to know what one of your simple pleasure's in life is. Chocolate? Coffee? Adorable children, pets or grandchildren?? SO many things to consider and we're excited to see what you create! What's my Simple Pleasure??? Here, let me show you! The simple pleasures are often the only ones you get as a busy parent so we sure make the most of them! I have decided to create my layout about cuddles. This picture was taken a long time ago (my daughter is almost 11 now!) and those lovely cuddles are very quickly running out so I decided to scrap one before they become a distant memory - (they sure dont happen in photos anymore!) I hope you have enjoyed my contribution and those of the rest of the design team! Your next stop is Kimberly and when you're all done visiting the new Design Team, we really hope you'll have time to join the fun! All our challenges run for the entire month, so you have time to play! Thanks for stopping by today! Hi Renee!! Aww, what an adorable little girl! My kids are turning 15 and 19 this yr and I still do baby pics lol I am far from a chronological scrapper! Looking fwd to having you on the team and seeing more creations from you! Welcome to Lasting Memories!!!! Welcome to your first Design Team!! Yay for you! Love the colors in this layout. Adorable simple pleasure. High on my list for sure. Like you and Karen... I am not a chronological scrapper. I should be for I have so many piles and piles of photos to figure out where they go. Love this and thanks for sharing with us. It will be fun to have you!! Such a beautiful page! 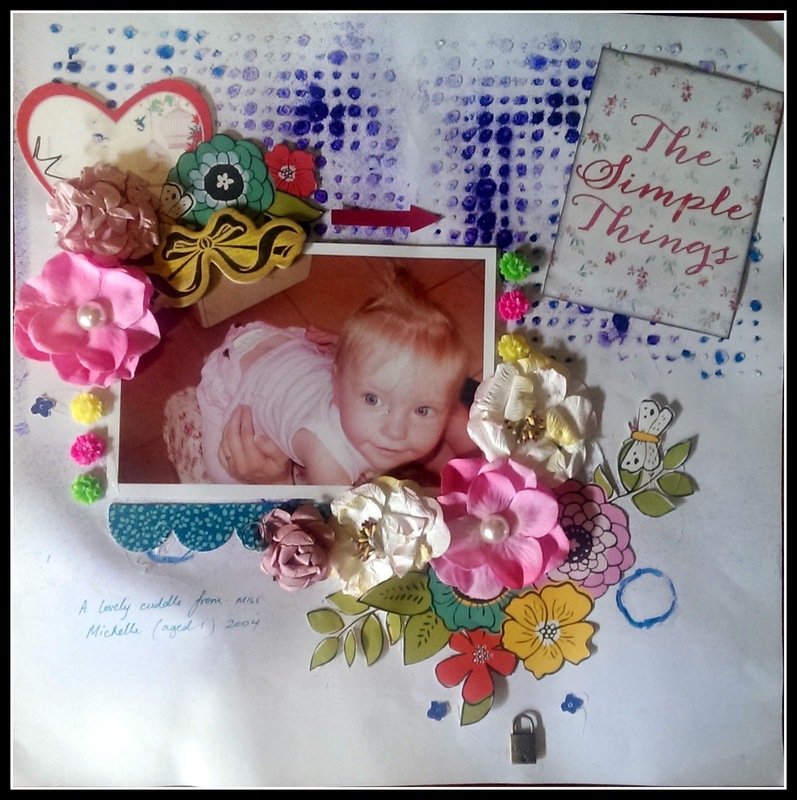 I love the mix of flowers and what a wonderful memory to scrap! I'm looking forward to being on the design team with you! Beautiful layout...great to go back and capture the moments! Love the variety of elements you used for the layout. Such a cute picture framed by the flowers. I also love the blue background. Looking forward to creating with you on the LM DT. What a gorgeous photo and such a sweet, feminine layout - love your flowers! Looking forward to a fun term on the LMDT! A mini album for me!! !